In August, Hewlett Packard made the shocking announcement that it would halt its webOS projects and potentially exit the PC market by selling or spinning off its Personal Systems Group (PSG) division. Along with the news the company began a firesale of the already discounted TouchPad to get rid of excess inventory from component suppliers. The 16GB model was advertised for a mere $99, while the 32GB model went for $149. Ironically, HP's tablet became such a huge success at this new price point that some vendors were hiking the price a bit in order to profit from the huge overnight demand. This weekend the TouchPad firesale returns one last time for U.S. customers. 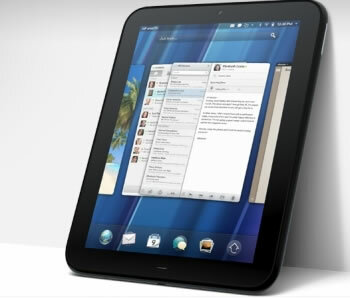 Starting Sunday, December 11 at 7pm Eastern time, refurbished 16GB and 32GB versions of the webOS tablet will be available on HP’s ebay store at the same $99 and $149 price points. HP will also offer an accessory bundle for $79, which includes a wireless keyboard, charging dock and case. Judging by how popular the last sale was, you will likely need to be very quick in order to successfully grab one at these prices. In addition, looking at HP's delivery policy on their eBay account it will only be open to U.S. residents, so those elsewhere in the world will unfortunately miss out yet again. The TouchPad tablet was pulled after just three months of disappointing sales on the market and as former CEO Leo Apotheker sought to refocus the company on the more lucrative software, systems, and services business. The unpopular decision -- or rather the lackluster way of communicating and executing it -- led to his ouster in September and replacement by former eBay chief Meg Whitman. Whitman decided shortly after taking the reins that the company would retain their PC business, and is expected to make a decision on webOS' fate next week. The company has already slashed more than 500 jobs at its webOS division and another 600 people remain in limbo while tough decisions are made.